Although it is a complete shame that the world is lacking living, breathing dinosaurs, you can revive a little of that long-lost era with a paper mache replica. 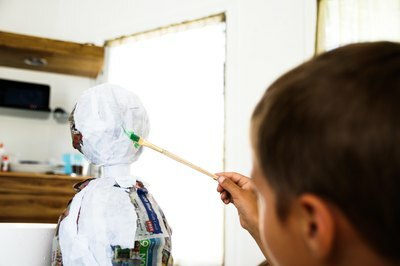 Making a paper-mache dinosaur is a fun art project to do alone or with friends. Children will enjoy the messy and creative aspects of this artistic undertaking as well. Whether you are interested in crafting a peaceful triceratops or a terrifying tyrannosaur, it will be a one-of-a-kind masterpiece. Inflate a large balloon as the central body part of your dinosaur along with a smaller balloon for its head. 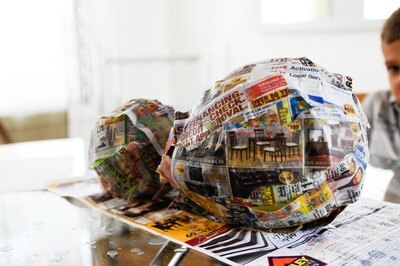 Soak strips of newspaper with wet wallpaper paste in a shallow bowl, lay them over the balloons and allow them to dry. Completely cover the balloons in two layers or more to give the art added strength. Attach paper towel tubes at even intervals to act as stable legs and a tail for the dinosaur. Be sure that the tubes touch the base at the same level and angle to keep your dinosaur from tipping over. 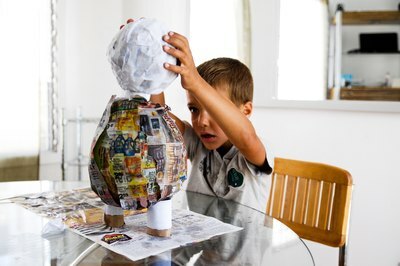 Join the head and body by gluing the paper mache spheres to the opposite sides of another paper towel tube. This tube functions as your dinosaur’s neck. Paint the dinosaur with acrylic and tempura paints. Include details such as eyes, nostrils and jaw lines. Be creative when coloring your dinosaurs, as the skin colors and body patterns of dinosaurs remain a mystery to mankind. 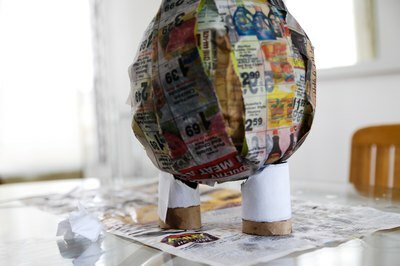 Wait for paper mache, glue and paint to dry before advancing with this project.